In June, Health Professions Network awarded a scholarship to Meagan Malnes, president of a local HOSA chapter in Idaho, through HOSA-Future Health Professionals' Scholarship program. In addition to serving as a HOSA chapter president, Malnes holds a 4.0 GPA from Idaho Virtual Academy, an online K-12 program, and acts as a student ambassador to help new students adjust to the virtual curriculum. Malnes was also the recipient of the Southern Idaho Conference Academic Award from 2012-2014 as a member of the Meridian Girls Soccer team. Her passion for soccer, and for helping others, inspires Malnes to pursue a career as an athletic trainer. "My ultimate career goal would be to work as an athletic trainer for a professional soccer team or university," she wrote in her scholarship essay. "To be able to train and care for athletes who are at that elite level would be a dream come true." "As a long-time athlete, I would understand the mindset of my patients, and be able to empathize with them throughout their recovery," wrote Malnes. Malnes plans to attend Boise State University with the financial support from HPN. BSU boasts a competitive and successful Bachelor of Science Athletic Training Program with a three-year clinical component, though Malnes hopes to continue her education towards a master's degree. Supporting outstanding students like Malnes through HOSA's Scholarship Program aligns with the goals of Health Professions Network---to promote awareness of all health professions and fields like athletic training. HOSA-Future Health Professionals does excellent work to inform and encourage young men and women interested in health professions. Indeed, Malnes credits HOSA for her determination to pursue athletic training as a career. "Competing in the written and skills tests made me realize the depth of knowledge and strengths I have, and the potential I have yet to grow into," she wrote. Continuing support for HOSA's scholarship program strengthens HPN's relationship with both HOSA and future health professionals everywhere. 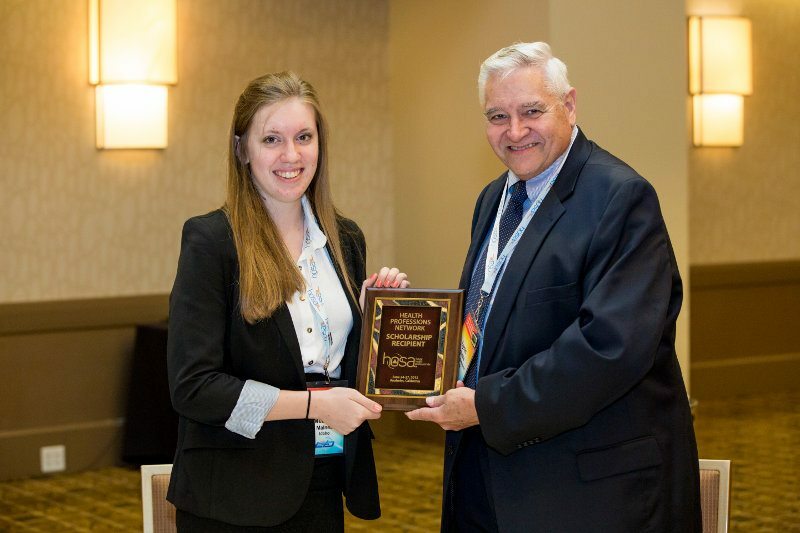 "HOSA-Future Health Professionals is appreciative of Health Professions Network's continued financial support on behalf of our scholarship awards program," wrote HOSA Executive Director Jim Koeninger in an email to HPN president Lynn Brooks. "Thank you again for being part of this program that reminds us all; these students are the next generation of health professionals!" Health Professions Network plans to continue supporting the HOSA Scholarship program, as it promotes our mission and provides our members the opportunity to connect with and support young leaders moving pursuing health professions.